On August 6th, this wandering Canuck got a little older and celebrated in style! I have to admit that my birthday wasn’t something I was thrilled about, but if it had to happen I can’t think of a better place then having it at Manjushri Monastery. It was a Saturday so there were no classes. The morning was super chilled out. I had some breakfast, did some yoga, caught up on a little reading and played with some of the boys. After lunch, I was getting ready to enjoy the bright sunshine and take a little walk when Sophie showed up at my door with two of the boys from the KG class and said they had something to show me. We headed for the garden, where a table had been set up and was surrounded by boys of all ages. On the table were TWO cakes…one chocolate and one vanilla! What an amazing surprise. I was definitely feeling the warm-fuzzies at that point. The boys sang Happy Birthday and we got down to the task of getting rid of the cake. I am not ashamed of the fact that I took a piece of chocolate AND a piece of vanilla. YUM! Leasang came out with gifts and Gen Luri (highly respected teacher) gave me a blessing. After the cake session wrapped up, I was heading through the courtyard and stopped to sit on the classroom steps to watch something amazing. There were a number of older monks visiting from Kathmandu for 3 days of Puja for the health of the Rinpoche. The first Puja was to be a fire Puja on Sunday. In order to set up for it, they built 2 brick squares in the courtyard, filled them with dirt and carefully poured many different colours of sand onto the dirt in intricate and beautiful designs, creating Mandalas. It was something I had seen in movies, but never expected to witness first hand, and certainly not on my birthday! While the cake and singing had made me feel really happy, watching the mandalas develop put me into a state of awe that I seem to be experiencing more and more frequently here in Nepal, whether it is while spending time with the boys at the monastery or walking through the surrounding hills taking in the beauty of the area. I have become very attached to this place and know it is going to be incredibly difficult to leave. Before I can leave, I had to sort out my passport situation. I had come to the point of having only 3 pages left (and visa’s each seem to take up a full page) so I had to apply for a new passport. I decided to do this in Nepal, as I was already planning to stay here for 2 months, and the process takes about 5-6 weeks. I had dropped off my application, complete with many references to be contacted to vouch for me, the day I left Kathmandu to come to Pharping. The application was then sent to Delhi for processing, where they decided that the shadow under my chin in my photo was unacceptable. So, I had to head back to Kathmandu, get another photo taken, head to the embassy and have them ship it to Delhi. Once there, I was told that the application would have to be sent to Canada to have the passport made, then sent back to Delhi, then to Kathmandu. Such efficiency! It felt quite unnerving to be without a passport and without hopes of getting one for over a month. However, on August 8th, I got an email letting me know that my new passport was back in Kathmandu and was ready to be picked up. So, on the morning of the 10th, I got on the 7:30am bus which had lovely leopard print seats, carpet on the ceiling, bits of wood covering the holes in the floor and was jammed with people, with more getting on the roof as we went. We arrived in town at 8:45, I walked the half hour to the Embassy and had my new and old passports in my hand within about 3 minutes of getting there. Phew! What a massive relief to once again be documented! The next task was to walk to the Indian Embassy and begin the week long process of getting a visa for my trip there. Once that process was started, I had to find the Nepal Department of Immigration to have my Nepali visa transferred to my new passport. This seemed straightforward when I read about it online. However, after walking about 45 minutes across town and spending ages getting thoroughly lost, I was beginning to have doubts about the process. I stopped beside a little paper shop in an alley to check the map again when a Nepali man came running over and asked if I was lost. I told him where I was trying to get to and he and 3 other men that he flagged down chatted amongst themselves for a few minutes before walking me out to a main road and telling me how to get to the Tourism Office. Their English was awesome and they were very helpful. They genuinely just wanted to help. The tourism office sorted me out and I managed to finally find the Department of Immigration. There I was sent to the 3rd floor where I filled out a form and was sent to the next office over to have it photocopied, then back in the original office, it was signed and I was taken to the 2nd floor to meet the Director of the Department of Immigration. He checked and double checked the documents, held up both the old passport and new one next to me to compare and then sighed and signed the form. I was taken back up to the 3rd floor where I was told to go down to the 1st floor to pay a $2 fee (I accidentally went to the cash desk on the ground floor, where I was reminded that the 1st floor is above the ground floor), then back up the the 3rd floor for another signature, off to the next office for another photocopy, then back to the first office for a stamp and I was finished! Although the process seemed a little more intricate then I thought it would be, everyone I met was very friendly and smiled at me every step of the way. After picking up my passport at the Canadian Embassy, starting the process for my Indian Visa and transferring my Nepal visa to the new passport, I was back on the bus to Pharping shortly after 1pm, just barely avoiding the rain. I snagged one of the lasts seats, which happened to be right beside the back door. There was no floor here, so for most of the ride, my feet were actually hanging out the door while the bus lurched up through the hills. I nodded off a few times on the shoulder of the teenage boy beside me, but he was gracious enough to pretend not to notice. After the hour and a half long ride and the walk up the hill, I was back at the school in time for afternoon tea (my favorite time of the day)! It was an adventure of a day, and after all the walking in the heat of the city and the holding on in the speeding, winding and bouncing bus, I was exhausted. I had not been looking forward to heading back into Kathmandu, but after encountering smiles and kindness everywhere I went, it turned out to be a pretty good day. And to top it off, my passport no longer looks like a mug-shot gone bad. This entry was posted in Nepal, Traveling and tagged Birthday, Monastery, Monks, Nepal, Passport. Bookmark the permalink. 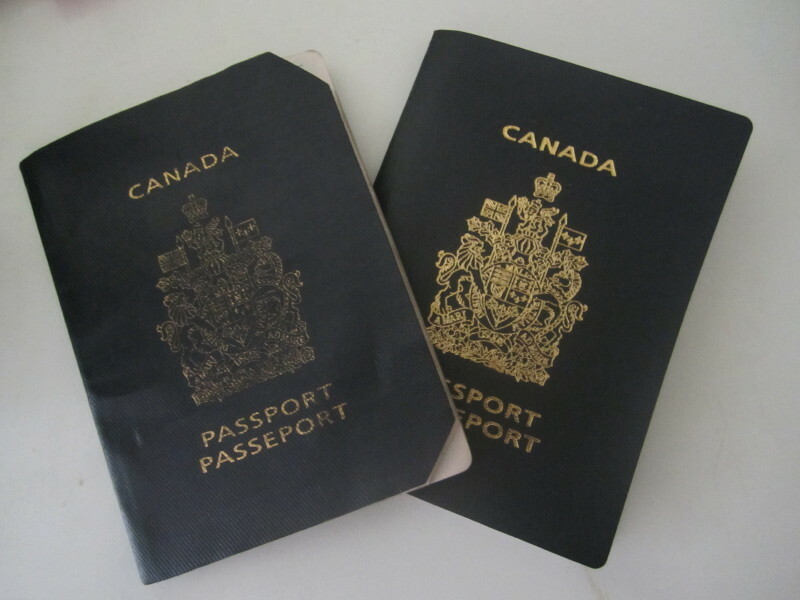 Wow – what a day for all that passport mess! up, down, over, copy, up, copy, sign, pay, up, copy, sign, down… wow. 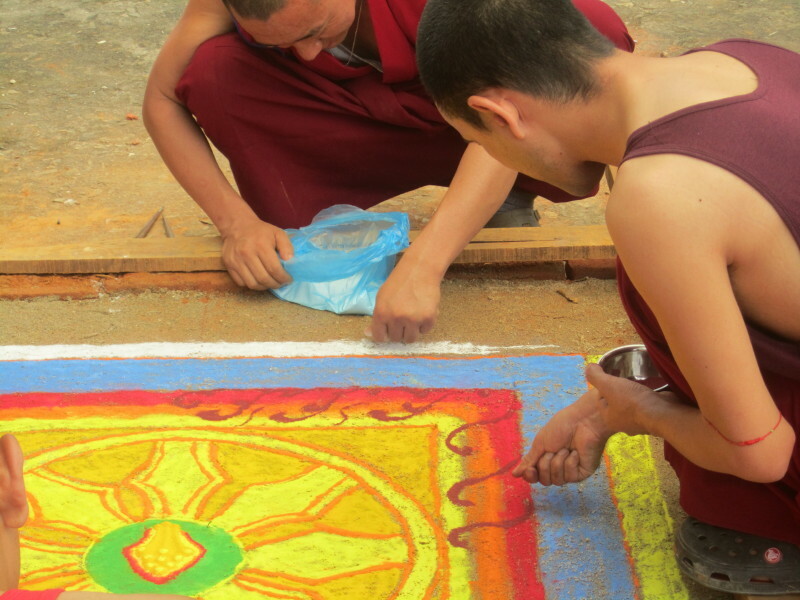 When I saw the photo of the mandalas being made I thought it was chalk art. Extra fantastic to know that it’s from pouring colored sand. Very interesting. I can see why that was just amazing to watch. What a great birthday!! Thanks for keeping us all up-to-date with your travels! Be safe. Thanks Mom! I had a couple pretty good teachers growing up! LOVE YOU! Mom’s been drinking because we were over for a visit, so don’t take her too seriously. I love the title of this one. It could be an episode of Scooby Doo. I want to see more Mandala pics. Beautiful! Miss you lots and lots! Kerri… rejoice in all your birthdays! They are the marker of what you are becoming… every year you release more of the debris and step beautifully into ALL that you are… each year brings you clearer, closer and more deliciously to that spiritual essence! Thank you so much for this blog… I get to experience things I love and believe in… through you!!!!!! !